The debate between those who believe God created the universe and those who believe in the naturalistic theory of evolution continues. There are some, believers in God, who do not think that this topic should be discussed as much as it is. They believe that there are other, more important, things (such as the Gospel) that should occupy our time and energies. Are they correct? Is defending the historicity of the Book of Genesis a waste of time? Or is it foundational to one’s understanding of our existence and our understanding of the Gospel message? Genesis introduces us to God and informs us of what our correct relationship with Him is supposed to be. Ken Ham writes, “Since God made all things, all things belong to the sovereign Ruler and serve to glorify Him (I Chronicles 29:11; Psalm 19:1-4; Isaiah 48:11-13; Revelation 4:11)”  Genesis clearly teaches us that God is the Sovereign Creator of the universe and we are His creations. We were created to love and worship Him and, when we fail to do so, we are living in sin. The entire backstory of who we are is contained in Genesis. If we fail to understand how we have fallen from what we were created to be, we cannot truly understand our desperate need of a Savior. The theory of evolution has convinced (brainwashed) many that science has concluded there is no reason to believe in God; rather, the existence of the universe and everything can be explained by naturalistic processes. This is the reason that Christians must continue upholding Genesis as absolutely true; the only other option is to acknowledge some authority, other than the Bible, as our ultimate source of truth. It is a question of authority: Do we believe God or do we believe fallible human theories? Either God created everything, including us, or He did not (as secular science would have us believe)…it cannot be both. Naturalism undermines God’s standard for how humanity should live (what is sinful, what is not), leaving us to decide for ourselves, using our sin-stained hearts and minds, what is right and what is wrong. This is why we are seeing an increase in immorality today. There is no foundation for morality apart from God. If we are merely the result of chemical processes and material substance there is no reason for us being moral people. It is illogical to assume that morals (not to mention thought, logic, truth, justice, love, etc.) originated from a rock or some other inanimate object. Therefore, if one subscribes to the naturalistic evolutionary worldview, morals are not something objective (or absolute); rather, they are a human construct that can be modified or even discarded if desired. Only if there is an Eternal Moral Lawgiver can there exist any type of objective moral standard. The theory of evolution would have us believe that morality sprang from lifeless matter. The book of Genesis is the foundation for the Gospel. Genesis tells us where we came from, why we are here, what went wrong, and how it can be fixed. We were created by God to worship Him, humanity disobeyed God and brought sin into the world, and God will provide the means of forgiveness for our sinfulness. Genesis provides us with the framework and foundation for understanding everything about our existence. To reject the truthfulness and historicity of the first book of the Bible leaves us without a lens by which to view our universe. The Genesis record tells us our history, the history of humanity. It tells us why we are here, where we went wrong, and how to be forgiven. Genesis explains our need for a Savior; it explains the reason Jesus died on a cross for us. The theory of evolution tells us that we are simply a bundle of chemical processes living out our lives on earth with no real purpose except to satisfy our own lusts and desires (whether these be moral or immoral). Secular naturalistic science declares that God does not exist and that this life is all there is. Secular science also says that a man cannot be resurrected. Are we to believe Jesus was not resurrected because secular science says things like that don’t happen? Does this mean we must cater to their ideas in the area of Jesus’ resurrection too? Will we trust God, and His Word, or the fallible theories of humanity? “The fear of the Lord is the beginning of wisdom, and the knowledge of the Holy One is understanding” (Proverbs 9:10 NASB see also Psalm 111:10; Proverbs 1:7). 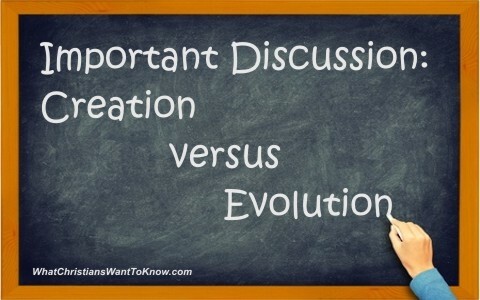 Related reading: How Do Christians Explain Evolution? Resources:  Mohler, A. 2010. Why Does the Universe Look So Old? Acts & Facts. 39 (10): 4-7. Ham, Ken. Genesis: Does it Matter? https://answersingenesis.org/genesis/genesis-does-it-matter/. G. Richard Bozarth, “The Meaning of Evolution,” American Atheist (September 1979): p. 30. I wonder if evolution theorists are surprised when a child kills his classmates at school or when a man goes on a killing spree at a mall or when a mother kills her defenseless young children. What is their opinion on these tragedies? When men lean on their own understanding instead of God’s Word, disasters abound. People then scurry around trying to make sense of what is happening in the world around them but being too proud in their own ways to acknowledge our Savior’s existence and repent. They want to follow their own lusts and desires, claiming their rights to do as they please. Unfortunately, they see not the truth, being lovers of themselves having the knowledge of fools and being guided and blinded by the deceiver, the devil. We need to pray and to beg God’s mercy be poured on this dying world whose rejection of Him grows exponentially everyday. May God in His loving kindness have mercy on their souls. Well said Carmen. I think, even for the Christian, there exists the eternal problem with self. Wrapping our minds around the fact that God did not make us to bless us, but that He made us to bless Him, is a daily struggle..(it is for me). It follows that to expect the non-believers to believe in the Christian’s worldview, of a God centered universe, when all they want and know and have been taught is a man centered universe, begs credulity. I appreciate Robert’s help in giving us tools to reason with their non-understanding. It is important to know and present the Truth in love. It is only by His Spirit though that the veil of their unbelief will be removed and that some of these folks will come to a knowledge of the Truth. I remember as a young new believer of having a Sociology professor at the University of Washington literally foaming at the mouth when I was discussing these matters back in the “Jesus Freak” movement of the early ’70’s. He asked the age worn question of what right I had of forcing my views upon the students in his class. I answered that I didn’t want to force anything upon him. All I wanted to say was that if, “you don’t believe in Jesus you will go to hell”. His mouth was literally stopped. He looked at me in shock and couldn’t talk. Seriously. Years later I fell across this verse, “The godly will see these things and be glad, while the wicked are struck silent.”(Ps 107:42). It reminded me of that professor. I echo your prayer that God will grant all of these unbelievers mercy, so that their eyes will be opened before their time is no more. Amen to that Pastor DocReits. Yes, it is my daily struggle too, to keep my mind and eyes on God. So many circumstances present themselves that without God’s peace, I would fall into a pit of depression and despair. Thank God for my Savior’s mercy and grace towards me. Next post: What Causes Churches To Split? How Can This Be Avoided?